Owner Cultiva series triple hooks are the best game fishing hooks available today in Japan. Points are very sharp hook wires are well heat treated to stand for extra load. TN coating is really salt resistant. Made in Japan. Jun's comments: I have trusted Cultiva triple hooks, and they never failed me. I've used Gamakatsu, Eagle Craw and other famous brands for years, and ended to Cultiva ST series for treble hooks. Please consider the balance between lines, rod power, and hook wire thickness. Thicker wire hooks stand for larger thrust from fish, but requires more force to penetrate jaws. I give you recommendations for your reference, and please refer to them in choosing. How about choosing a little thinner wire hooks, if you experience hook offs sometimes. I often see anglers choose hooks just because they are very sturdy, but those hooks tend to be too thick to penetrate jaws. Thinner, sharper hooks may penetrate jaws with the same hooking power. 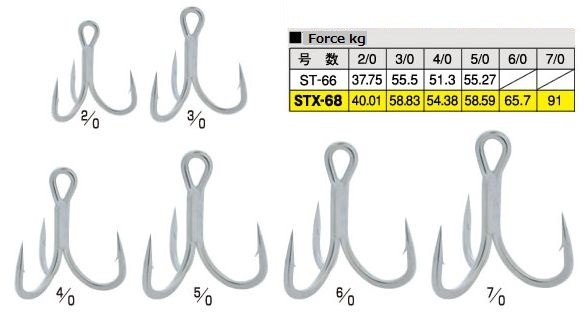 I mainly use ST-36 and 46/47 size #1 and #1/0 hooks for Mahi growing up to 15kg here in Japan. Matched line is 30lb braided and 30-60lb mono leader. ST-36 may be a little too thin, but I have rarely lost fish due to hook wire bent open. I often change those thin wired hooks after I see wires are slightly open or bent. 10% stronger Tough Wires are employed to stand for instant load from braided lines. Regular wire hooks, great for freshwater bass, trout, salmons, walleyes and other freshwater/saltwater games. Ultra sharp hook points. The best salt resistance among owner hooks to date. Dark grey color. Recommended for up to 3-5kg/7-11lb fish, with 4-20lb test mono lines. 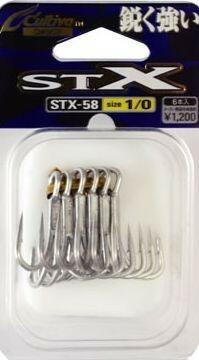 STX hooks are the most advanced hooks with harder wire material to be used with braided lines. Heavy wire hooks, great for wide range of off-shore fishing. Straight hook point design Tin coating gives the superb salt resistance, keeping the ultra sharp hook point for quite long time. Recommended for up to 15kg/33lb fish, with 30-50lb test braided lines, or 20-30lb mono lines. 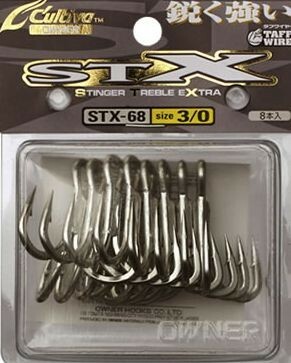 STX hooks are the most advanced hooks with harder wire material to be used with braided lines. Extra Heavy wire hooks, great for heavy off-shore fishing. Target fish will be GT, Tuna, and etc. Straight hook point design Tin coating gives the superb salt resistance, keeping the ultra sharp hook point for quite long time. Recommended for up to 30kg/66lb fish, with 40-80lb test braided lines.